Payment processor First Data today introduced a new, more portable point-of-sale system called Clover Mobile at the Money 20/20 conference being held now in Las Vegas. The handheld solution is an extension of the Clover brand. As you may recall, First Data debuted its first Clover-branded point-of-sale system aimed at small to medium-sized businesses in October 2013. That was also when First Data publicly confirmed that it had quietly acquired the Andreessen Horowitz-backed mobile payments startup Clover. That system has now sold over 26,000 units, the company says today. Meanwhile, the new system, designed to work wirelessly with a portable, tablet-sized device, is now in pilot testing and will be made available to merchants in 2015. Clover Mobile will allow merchants to place order, take payments, scan inventory, clock in employees, and sync sales data with accounting software, and more. It works as a standalone register, so merchants don’t necessarily need to have the Clover Station product. However, it can be paired with a Clover Station, if the merchant chooses. The tablet device is able to support standard card swipes, chip-and-pin EMV cards, NFC (Google Wallet & Apple Pay), barcode scans. It also includes a Bluetooth-connected mobile thermal printer that can be mounted on a belt for receipts that don’t require a trip to a “real” register. The system is powered by a rechargeable battery which comes with an optional charging stand. Merchants can order Clover Mobile with Wi-Fi-only support, or with both Wi-Fi and 3G support, depending on their needs. Clover Mobile will also offer access to Clover’s “App Market” which offers a range of merchant-focused applications including First Data’s own Insightics solution, Perka (loyalty), Gyft (gift cards), and others. Like many competing products, Clover’s software is based on Android, which makes it easier for developers to port their apps to its platform. The company has yet to reveal pricing. 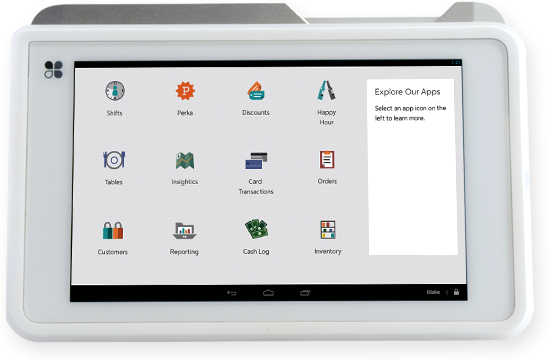 First Data is hardly alone in working to offer a connected, tablet-based POS solution for smaller merchants. This is the same space a number of companies are going after today, including Square, Groupon, Leaf, ShopKeep, GoPago, Revel, and many more. Most recently, former Google Wallet head Osama Bedier announced his company’s entry into this market with Poynt, a “future-proofed” POS based on Android software.